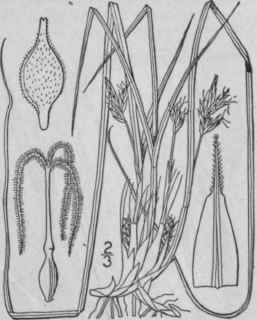 Carex deflexa Hornem. Plantel. Ed. 3, 1: 938. 1821. C. deflexa var. Deanei Bailey, Mem. Torr. Club 1: 42. 1889. Rootstocks slender, loosely branched and short-stoloniferous, culms filiform, erect or spreading, 1-12' long, shorter than or little exceeding the narrow bright freen leaves. Bracts subulate or very narrowly linear, '-2' long; staminate spike sessile, 1"-3" long, inconspicuous; pistillate spikes 1-3, 1"-2 1/2" long, subglobose, 2-8-flowered, all sessile and closely contiguous or the lower somewhat separated, usually also 1 or 2 nearly basal filiform-stalked spikes from the lowest sheaths; perigynia oblong-obovoid, much narrowed at the base, short-pubescent, 1" or less long, tipped with a flat, slightly 2-toothed beak about one-fourth the length of the body; scales ovate or ovate-lanceolate, acute or cuspidate; stigmas 3. In open places, Greenland to Alaska, south to Massachusetts, Pennsylvania and Minnesota, mostly at high altitudes. Summer. 334. 1896. C. Farwellii Mackenzie, Bull. Torr. Club 37: 244. 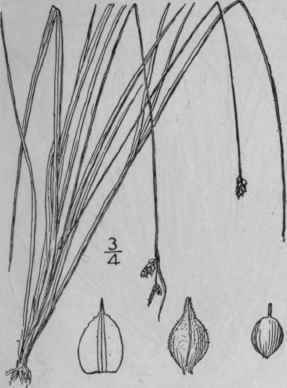 Rootstocks slender, loosely branched and stolo-niferous; culms slender, erect, 8'-15' long, shorter than or little exceeding the leaves. Leaves about 1' wide; lowest bract conspicuous, often exceeding inflorescence; staminate spike sessile or nearly so, 3"-6" long, conspicuous; pistillate spikes 2-3, 21/2-4" long, short-oblong, 3-10-flowered, sessile or short-peduncled, approximate or the lower separate, filiform-stalked; basal spikes conspicuous; perigynia oblong-obovoid, much narrowed at base, short-pubescent, 2" long, abruptly contracted into a bidentate beak from one-half length to nearly as long as the body; scales ovate, obtusish to short-cuspidate; stigmas 3. Dry soil, Michigan to British Columbia, Oregon, and south in the Rocky Mountains. June-July. C. nigro-marginata Schwein. Ann. Lyc. N. Y. 1: 68. 1824. Bright green, stoloniferous, culms filiform, wiry, aphyllopodic, erect or spreading, 2'-8' long, very unequal in length. 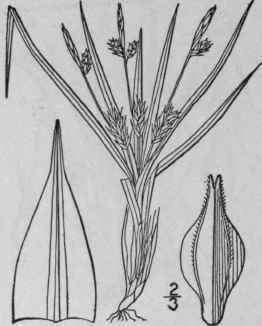 Leaves 1"-2" wide, very much longer than the culms, rather stiff, often 12' or more long; bracts very short and subulate or wanting; staminate spike sessile, inconspicuous, 2"-4" long; pistillate spikes 1-3, few-flowered, sessile at the base of the staminate, about 3" long; perigynia 1 3/4" long, short-pubescent or nearly glabrous, the body oval, 1/2" thick, stipitate, 1-ribbed on two sides, tipped with a cylindric-subulate 2-toothed beak one-third to one-half as long as the body; scales ovate, acute or cuspidate, green with purple margins or variegated, rather longer than the perigynia. Dry soil, Connecticut to South Carolina. April-July. 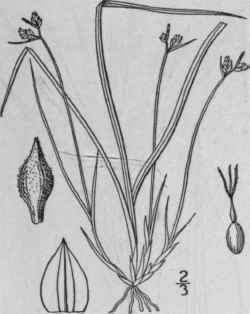 Carex floridana Schwein., distinguished by its light-colored scales, occurs from Virginia to Florida and Texas.